A romantic Caribbean french vacation are activities that couples should take as often as possible. It is a time when couples truly express their passionate feeling toward each other. However, there are some many spots where couples can have a romantic vacation that they may not be certain of right place for them. The French Caribbean islands are some excellent spot to spend a holiday. This is especially true for many of the Caribbean islands. However, the main French Caribbean destinations of Martinique and Guadeloupe have excellent vacation spots for romantic couple. Having a romantic vacation in a French Caribbean destination can be a big step in creating lasting memories for you relationship. The French Caribbean island of Martinique is located north of St. Lucia and south of Dominica. Martinique offers a great French romantic vacation options for visitors to the Caribbean. The island is volcanic in nature which gives its lush rainforest and vegetation its beauty. This has allow it to offer most of the best locally grown foods along with many European cuisine which giving visitors a similar taste of the French culture. Romantic couples can enjoys romantic vacation activities such as hiking, mountain climbing, scuba diving, parasailing, surfing, exploring the many waterfalls, visiting of famous many famous botanical gardens as well as enjoying the many white sand beaches long the island coast. There are also many sailboat and yacht charter companies that allow couples to go on romantic cruises off the island. 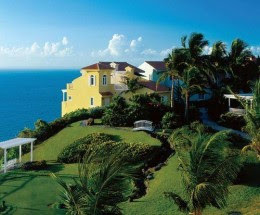 Le Cap Est Lagoon Resort and Spa, Le Domaine Saint Aubin,, Domaine de l'Anse Ramier, Hotel Diamant Les Bains, and Auberge de L'Anse Mitan are some of the romantic hotels in Martinique. The French Caribbean island of Guadeloupe is located south of Antigua and north of Dominica. There are three other small islands in the territory. These are namely LaDesirade, Marie-Galante and Iles des Saintes. One of the district features of the island being a part of the nation of France is the islands’ currency is the Euros. However, the island is an excellent romantic destination offering both exciting Eco-tourism attractions and wonderful beach activities. The La Cascade aux Ecrevisses waterfall is one of the island most romantic inland attractions. It allows romantic couples to picnic around a cool flowing river. There are also the Carbet Waterfalls which have three different falls offers visitors an excellent hiking experience which are really lovely romantic vacation activities. When it comes to beaches the island provides them in all dimensions. These include the beaches with the powdery white sand which are mainly found on the island of Grande-Terre, the volcanic black sand beaches and the golden brown sand beaches. The islands also provide some excellent sporting activities like boating, hiking, snorkeling, fishing, hunting, sightseeing and entertainment. Le Jardin Malanga, Hotel Amaudo, La Toubana Hotel and Spa, Habitation Grande Anse and Residence Grandbaie are some of the resorts on the island that are excellent romantic getaway. The island of St. Barthelemy or St. Barths is another of the French Caribbean islands. Like the other island the official language is French, but there are natives how speak English as well. The island currency is the Euro as with other French territory. St. Barths is one of the safest places in the Caribbean with few minor crimes throughout each year. This has allowed the island to be one of the top French Caribbean vacation destinations. Some of the romantic activities you can engage in include horseback riding, hiking, dining at romantic French restaurants, watching movies outdoors, snorkeling, scuba diving and tennis to name a few. Some of the island top romantic resorts are Hotel Le Toiny, Guanahani Hotel, Carl Gustaf Hotel and Eden Rock. The island of St. Barths can be reached easily through Antigua, Puerto Rico and Guadeloupe from major North American and European destinations. Access can also the gained via St. Martin by air of by boat. However, most time the journey by boat is often uncomfortable. St. Martins is probably the most unique island in the Caribbean. This island, through small is divided into two parts. These are the northern part of the island which is French and the southern part of the island which is Dutch. The respective European country's governors each side of the island. Additionally, the corresponding currency is used on each part of the island but, the US currency is also widely accepted. An important thing about the island residents is they can speak French, Dutch, English and Spanish fluently. This makes the island one of the best French Caribbean romantic vacation territories and its multilingual citizens. The island provides easy access from international gateways in Europe and North America. St. Martin has over 37 lovely beaches for romantic couples to enjoy. There are also water sports activities like snorkeling and scuba diving along with others. Additionally, there is Harley Davidson types biking riding which is a great attraction for couples who love this type of adventures in the French Caribbean destination. Some of the island top romantic resorts are Le Domaine de Lonvilliers, Club Orient Resort, Hotel L'Esplanade, La Samanna by Orient-Express and Marquis Boutique Hotel and Spa.